Oh Hey There! : Health || Abel & Cole Veg Box! Although I enjoy eating a healthier diet and love eating lots of vegetables my organisational skills when it comes to eating are terrible. It often takes me 2 or 3 hours to decide what to eat for dinner, meaning I end up not eating till gone 10 o'clock at night! I am also terrible at breaking my routines and tend to cook the same things over and over again on rotation. So, I decided I needed a bit of a nudge to start engaging with some better eating habits! I have always loved the look of Veg Box subscription services but never really been sure about how it would work, what would be in it, would it all go to waste etc so when Abel & Cole contacted me letting me know they had an offer on at the moment, I kind of just caved. But! I am glad I did! The Box I chose was the Small Veg Box for 1-2 People. It costs £10.50 and was delivered right to my door. If I am out it can be left in a safe place until your return. For me this is actually just outside of my flats door. It comes in a cardboard box but is wrapped in a large, thick plastic bag so it can be left outside for a length of time, no matter the weather. The box is also reusable and it designed to be left out for the delivery person to collect when your box is delivered. 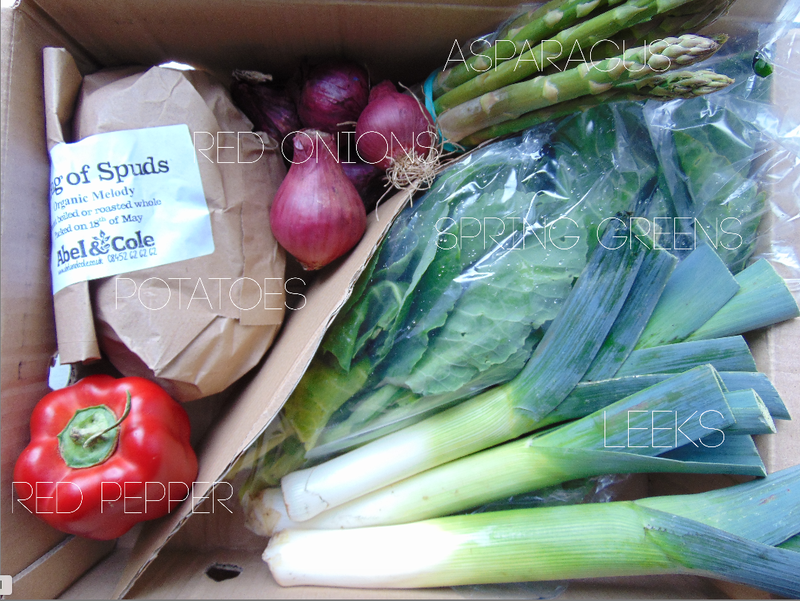 Abel & Cole Small Veg Box for 1-2 People. The selection of veg changes each week and seasonally. This week I got Potatos, Red Onions, Red Pepper, Spring Greens, Asparagus and Leeks. One of the things that set Abel and Cole apart from a few other veg boxes services that I considered was the fact that I could rule out certain items. For instance this week the box said that Cucumber would be included. I don't really eat much cucumber so was able to cancel this specific item, which was then be replaced with another vegetable. This week it was a Red Pepper which is perfect for me and it was very useful to be able to replace items! You can rule out certain items permanently if you know you will never want them or just as a one time thing. The veg is all organic, really fresh and all arrives in great condition. Abel & Cole also offer a really great variety of boxes, for example boxes with both fruit and veg, salad boxes, larger boxes etc. There are also many other products available ranging from desserts to household items to freshly baked breads. This week I added some eggs to my order and I am looking forward to try out some more of their extras. They all come delivered with your box and can be added to arrive every week with your box or just as a one time treat. 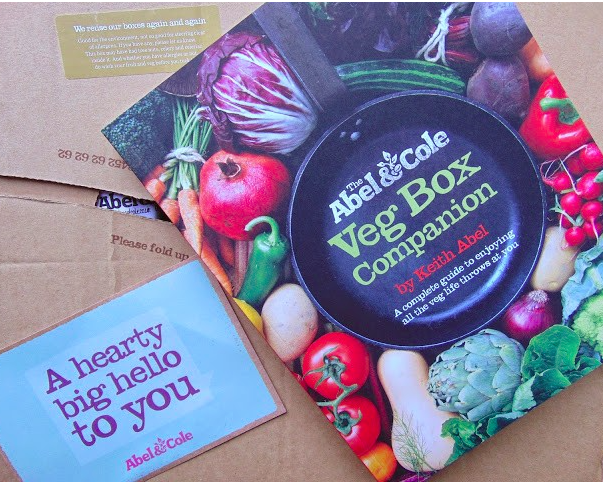 Abel & Cole Veg Box Companion Recipe Book by Keith Abel. Currently Abel & Cole are offering a free copy of their recipe book Veg Box Companion to anyone who signs up for a box if you add the code EATVEG at the checkout. It is actually a really nice recipe book with some great ideas. They are all very veg based (obviously) which is great for me as a vegetarian but it also does include many meat and fish recipes. There are also a lot of vegan recipes and clear labels informing of dietry requirements. The book also contains loads of lovely photographs if the recipes, which is something I love in a recipe book. You want to see what it should look like, right? Abel and Cole are also offering a 4th box free of charge when you sign up for a box at the moment included with the code EATVEG. Do you subscribe to a Veg Box service? Ohh I've been meaning to go for something like this. I'm tired of getting fruit and veg at the store, they are covered in chemicals and are sources from random places. I'd love instead to go local = more green + fresher + healthier. Don't need more chemicals in our bodies. Its a great service and they are all super friendly! Thanks for reading!